UkrOboronProm, the Ukrainian state-owned concern managing the country’s defence industry suppliers and manufacturers, is promoting the progress its aviation group – i.e. Antonov – made through 2017 with the An-132D light transport and special mission aircraft platform. In its press release, UkrOboronProm touts the An-132D as “the first Ukrainian aircraft, manufactured using advanced avionics from world leading companies…” including, among others, Honeywell, Pratt & Whitney Canada and Dowty Propellers. The An-132D was developed in partnership between UkrOboronProm and Saudi Arabia’s Taqnia Aeronautics. UkrOboronProm lauds the short turnaround time between the formal start of the partnership in May 2015 and the An-132D’s maiden flight in March 2017. For UkrOboronProm, the An-132D has been a successful case of Ukrainian companies not only partnering with prospective buyers (e.g. joint-developing and co-production), but also drawing upon credible third-party original equipment manufacturers (OEM) in North America and Western Europe. 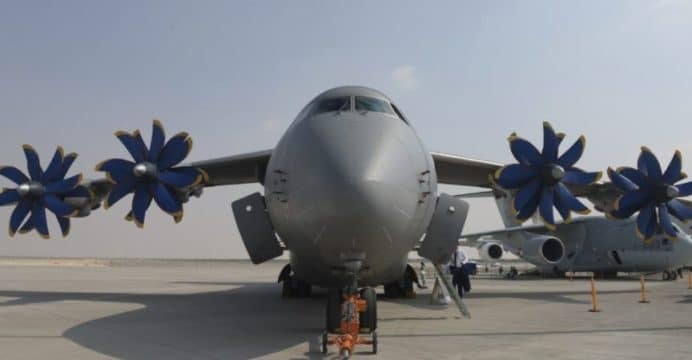 Building upon the An-132D’s success (albeit in terms of coming into fruition as a marketable product, the aircraft has yet to secure third-party sales), UkrOboronProm is intent on reviving the An-70 strategic air-lifter. The An-70 was developed through the 1990s and 2000s, but technical complications and cost had resulted in the program getting shelved. Intended as a competitor to the Airbus A400M and Lockheed Martin C-130J, the An-70 can ferry 47 tons for a range of 3,000 km. It relies on four Motor Sich D-27 propfan engines. Currently, UkrOboronProm’s An-70 revival effort – also designated An-77 – aims to supplant the aircraft’s Russian components with Ukrainian and/or Western equivalents. In this vein, the An-70/An-77 will also be equipped with subsystems (e.g. avionics) found on competing platforms, thus ensuring that the An-70 provides the same solutions (e.g. computer-aided air release point) as the C-130J, A400M and others.